A 38 North exclusive with analysis by Jack Liu and Peter Makowsky. 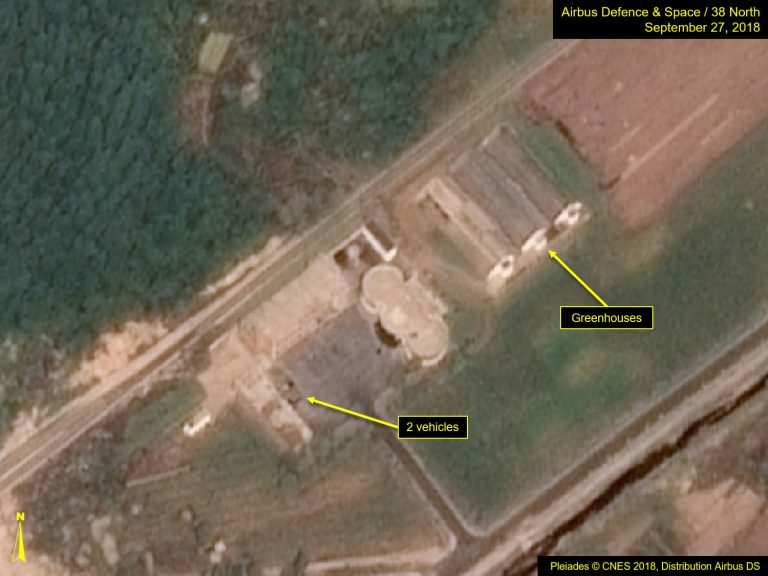 Recent commercial satellite imagery of the Sohae Satellite Launching Station (“Tongchang-ri”), North Korea’s main space launch facility, indicates that despite dismantlement pledges formalized in the recent Pyongyang Declaration, no additional activity has been observed at either the vertical engine test stand or the launch pad since August 3. 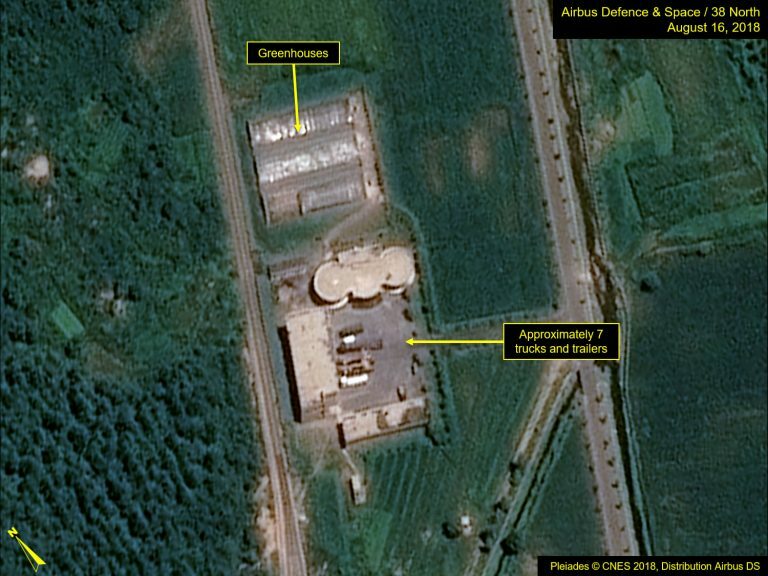 Based on available information, the lack of activity could be for a number of reasons—for example, North Korea may be waiting to arrange a visit of international observers or for the results of Secretary of State Mike Pompeo’s upcoming visit—and should not be interpreted as meaning that Pyongyang will not follow through on its pledge. 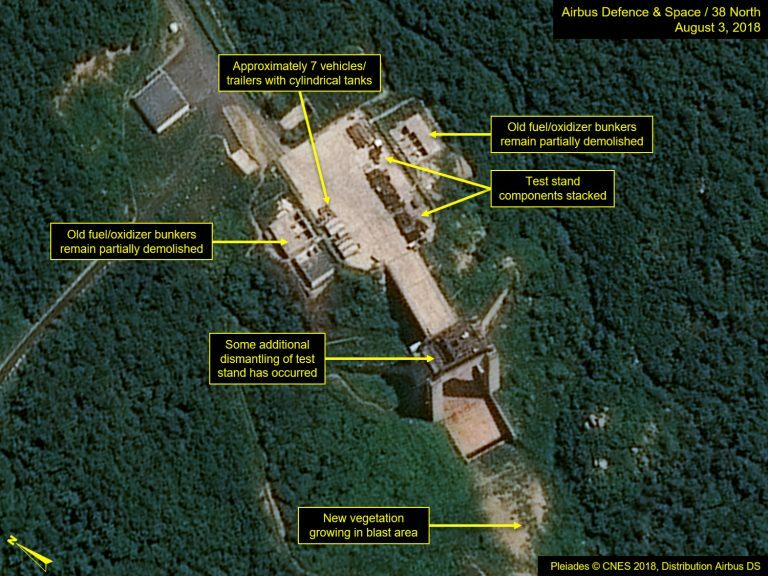 While the presence of expert observers will be important, dismantlement of the Sohae facility will also be observable by commercial satellites. The most important, and most easily verified, action at the vertical engine test stand would be to demolish its foundation, a substantial piece of structural engineering that would be difficult to reconstitute and easy to observe by satellite. Dismantlement of the gantry tower for satellite launch vehicles would also be easily observable from space. 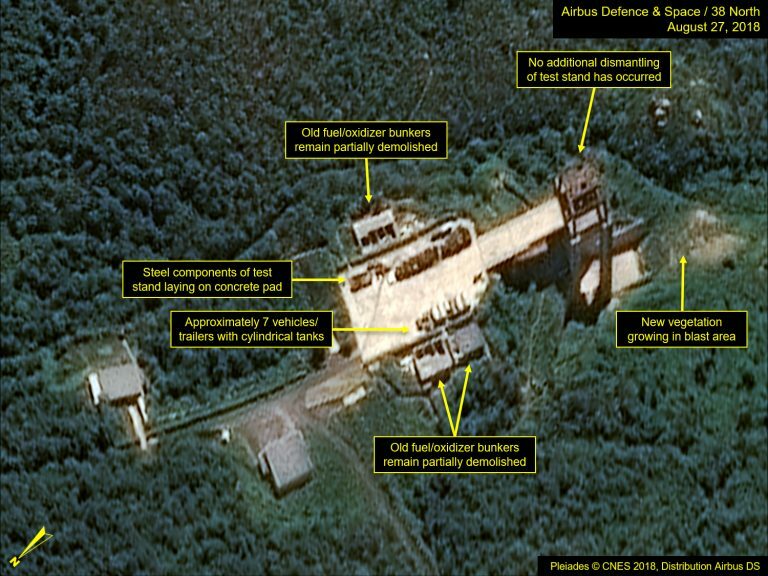 While many experts have dismissed this step as unimportant, it would effectively signal that Pyongyang is discontinuing what has been an active space (satellite) program for over a decade—a program that has probably cost tens if not hundreds of millions of dollars to develop. 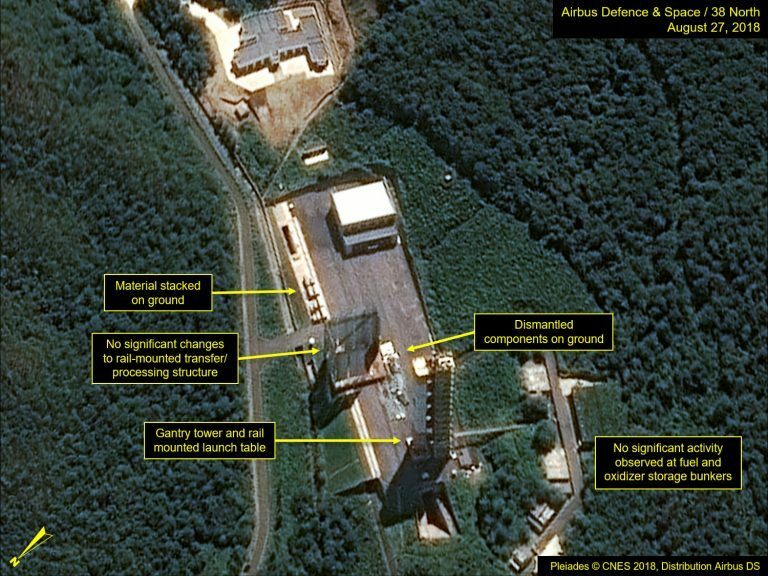 In doing so, the North will also close a potential loophole in future ballistic missile limitation agreements, as the Sohae launch pad could be used to launch a space launch vehicle derivative of Pyongyang’s Hwasong-15 intercontinental ballistic missile (ICBM), allowing them to at least claim the test was for legitimate peaceful purposes, an argument that would resonate with China and Russia. 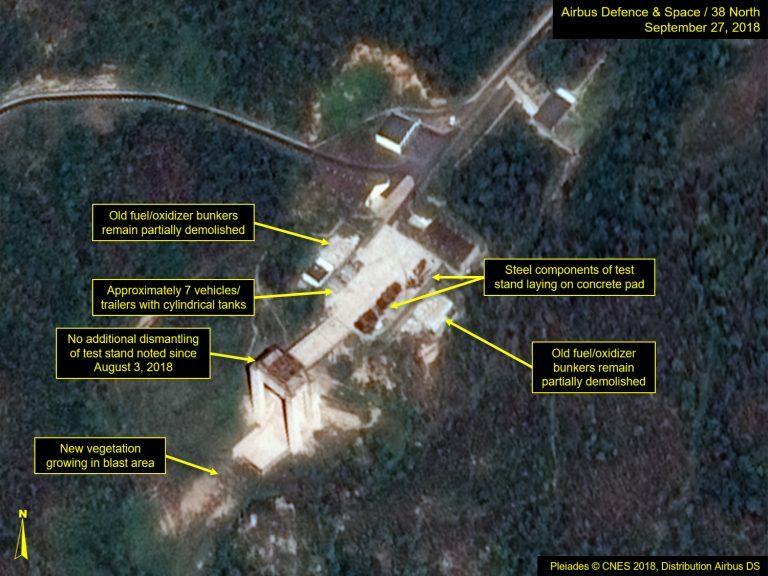 At the vertical engine test stand, significant dismantlement activity took place from July to early August, but imagery from September 27 shows no progress has been made since August 3. 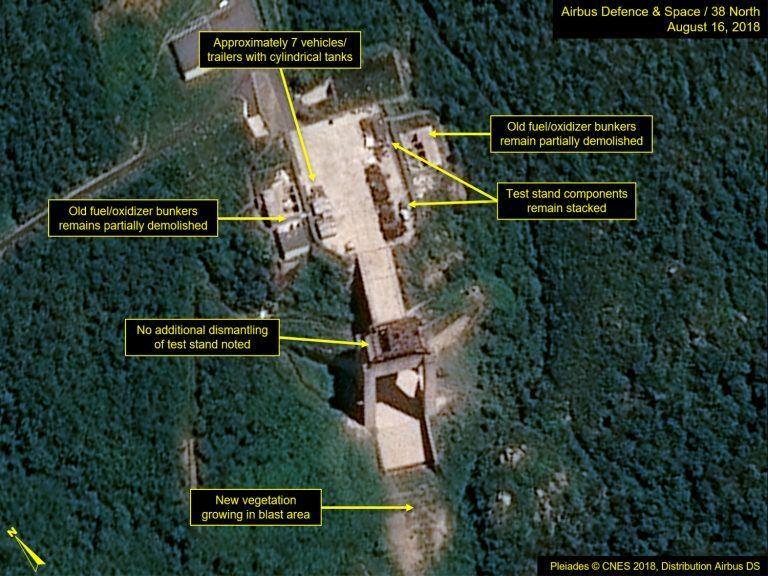 The test stand parts and components have remained on the ground undisturbed over that eight week period. Figure 1. No new dismantlement activity at the engine test stand from August 3 to September 27. Figure 1A. No new dismantlement activity at the engine test stand from August 3 to October 31. Figure 1B. No new dismantlement activity at the engine test stand from August 3 to October 31. Figure 1C. No new dismantlement activity at the engine test stand from August 3 to October 31. Figure 1D. No new dismantlement activity at the engine test stand from August 3 to October 31. 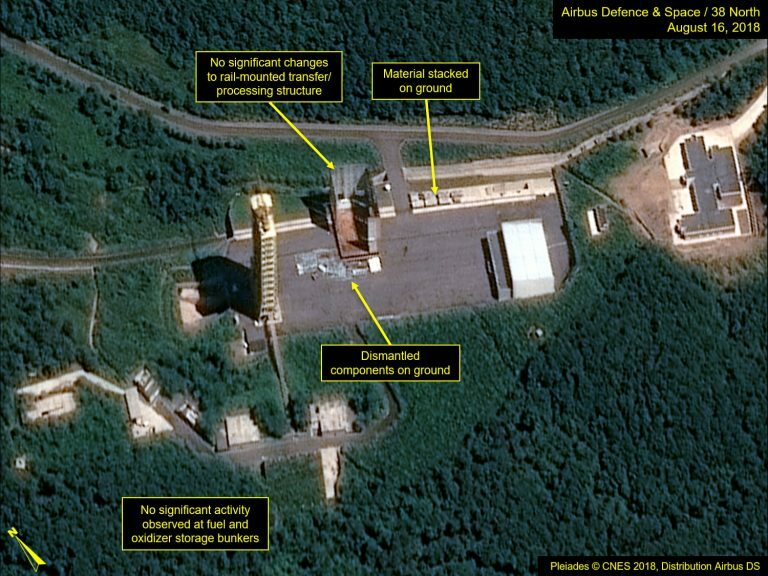 The launch pad, where North Korea has conducted its last three satellite launches, has remained in the same condition since August 3. The rail-mounted transfer/processing structure has been partially disassembled with the parts lying on the ground undisturbed since August 3. The gantry tower and on-pad processing building remain intact. 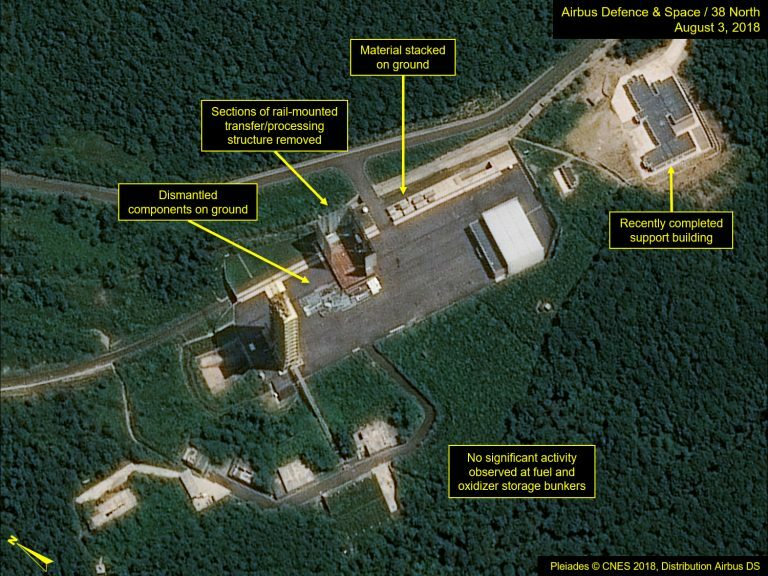 While it is impossible to determine whether the launch pad was being dismantled or modified based on imagery alone, the North Koreans formalized its intent to dismantle this structure at the recent inter-Korean summit declaration. Figure 2. 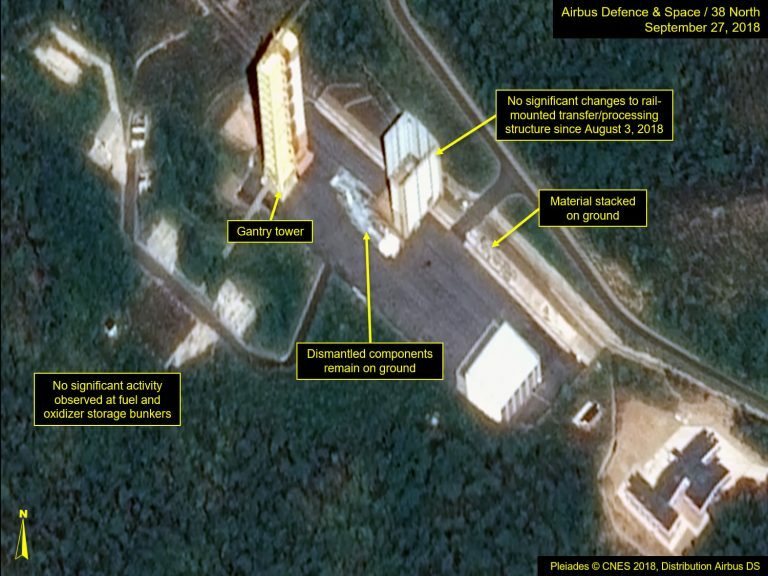 Components on the launch pad remain undisturbed since August 3. 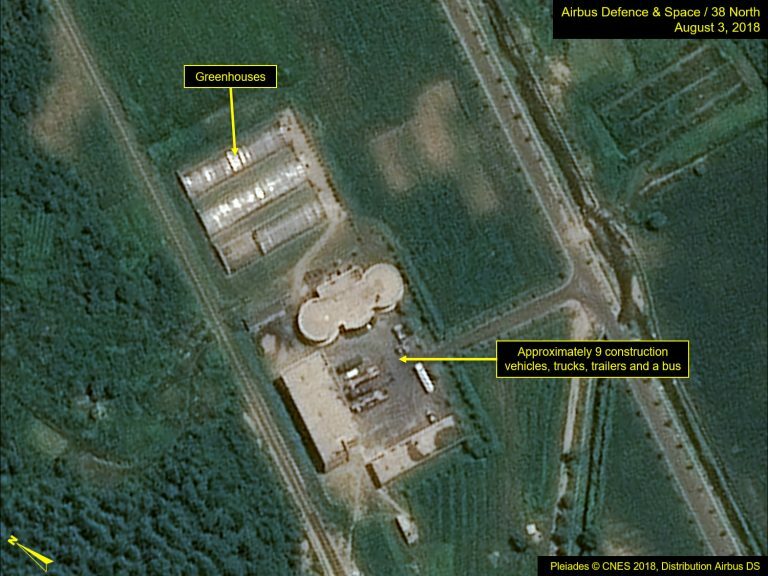 When dismantlement activities were taking place, several trucks and trailers were observed at the administrative and security headquarters located near the entrance to the secure Sohae facility. The last time vehicles were seen here was August 16, when seven trucks and trailers were present. While it is possible vehicle activity has taken place between the dates when imagery was acquired, no vehicles were observed in this area on August 27 or September 27. Figure 3. 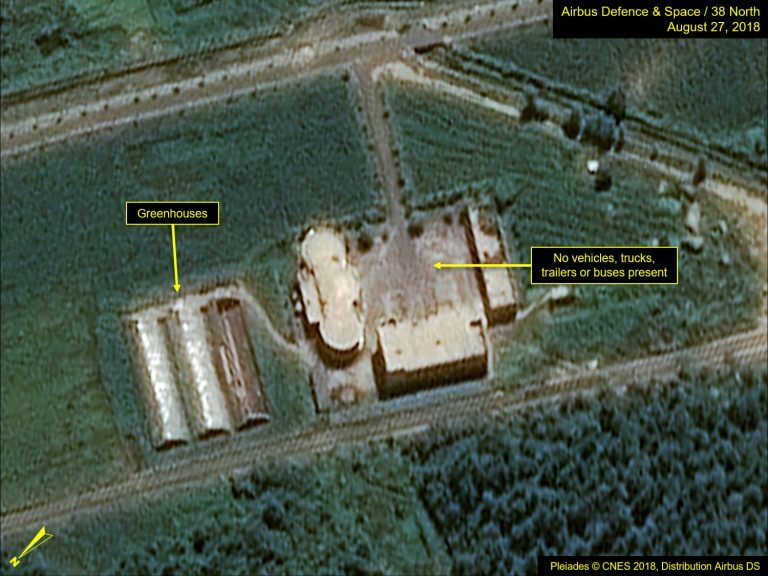 No trucks and trailers are observed at the administrative and security headquarters in more recent images.